The new B class (shown as an illustration) will have the so-called 'predator face' of the A class. It has a more rounded, sportier look than its boxy predecessor. Mercedes-Benz says the new B-class compact minivan will look and feel more dynamic than the current model. It will also gain more comfort features. Mercedes went ahead with the third-generation B class despite falling sales. The B class sold 120,000 in 2012 soon after its launch but demand had slumped to just over 62,000 last year. "The B-class is part of a significant and promising segment," Mercedes sales head Britta Seeger told Automotive News Europe earlier this year. Mercedes said the new model will offer more dynamism and comfort, while also giving more interior space than the outgoing model. The new B class will have the new MBUX (Mercedes-Benz User Experience) touch-control system, which features a wide screen stretching from behind the steering wheel across onto the dashboard. The touch-control system extends not just to the screen but also an optional touchpad on the center console and touch-operated buttons on the steering wheel. Mercedes claims the car will have advanced driving assistance systems to give it "one of the highest standards of active safety in the segment." The B class will offer more efficient, cleaner engines compared with the outgoing car, Mercedes said without giving details. The car is expected to offer the same engines as the A class, including an entry 1.3-liter turbocharged gasoline engine developed with Renault-Nissan. Other engines are expected to include a 2.0-liter gasoline and a 1.5-liter diesel. The B class will debut at the Paris auto show on Oct. 2, bringing the number of new models built on Daimler's newest modular front architecture (MFA) to three. Nine are planned. 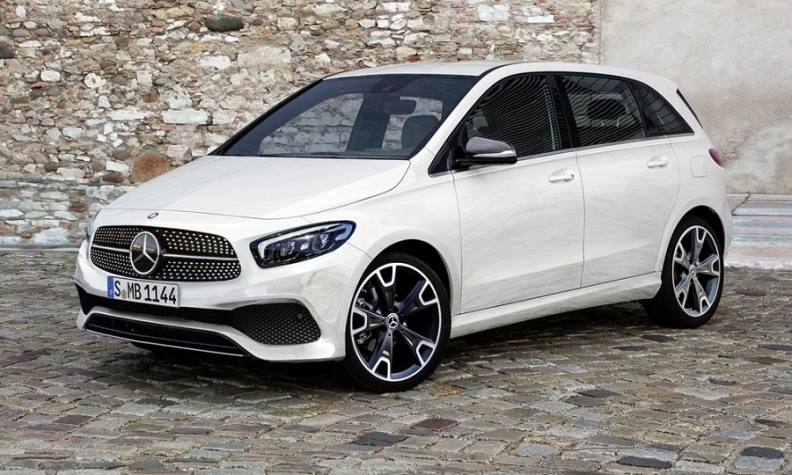 The B class follows the launch of the new A-class hatchback earlier this year and the A-class sedan, which has just gone on sale. Other cars using the new MFA platform will be replacements for the GLA SUV, and the CLA coupe-styled sedan and shooting brake. A second compact SUV likely called the GLB is expected to join the range with the option of seven seats. Mercedes sold 41,377 B class models in Europe in the first eight months, down from 45,698 through August the year before, according to market researchers JATO Dynamics.